This entry was posted in Local Culture, Places and tagged Spinalonga, The Island, Victor Zorba, Victoria Hislop. Bookmark the permalink. ← Matala and Joni Mitchell. The Island; by Victoria Hislop. I Do not recommend this book.It iss a dreadful book. She has no real idea of Cretan village life and has imposed her British ideas of ‘how things ‘spossed to be ‘ onto a mushy pseudo-romantic fairy tale. I dont mean to be rude but that is a very good book and she did a good job. Also if you don’t any thing nice to say don’t say it at all. In response to Marta (above), I just finished “The Island” and after living in a Greek Village for the last 20 years found it to be a thougtful and well researched piece of work. And an extremely moving dramatisation of how life must have been for those unfortunate enough to have been exiled to Spinalonga not so many years ago. That’s why I’m here now learning about the history of the island. 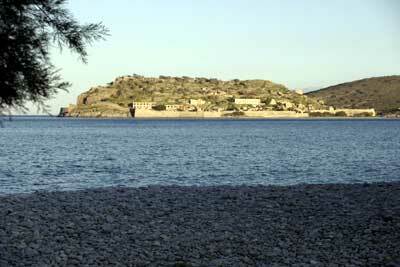 I also am researching Spinalonga because of the Novel, The Island. It’s the most inspiring novel i’ve ever had the pleasure of reading, and I think you had bad memory and are shaping others views on your memory. I found the book amazing, very well researched and very intricately written. Never have I read a novel…and i’ve read thousands, and been inclined to travel to that very location. Don’t use your negative attitude to persuade others, its misleading!! Those who haven’t read ‘The Island, by Victoria Hislop…you will not regret!! For those interested in Islands and/or the history of Hansen’s Disease (leprosy) visit the Friends of Peel Island website http://www.fopia.org.au for information on the Lazaret (1907-1959) on Peel Island (Qld) Australia. (There is no tourist access available to visit the site). To each his own Martha. I agree with Rhonda. Victoria Hyslop’s book, “The Island” was well researched and the story sensitive and compelling. It’s fiction, yes; but fiction detailing the horrible plight of victims of Hansen’s Disease and their family and friends. If you are interested in reading another novel with very similiar circumstances with a Canadian backdrop look for “To All Appearances a Lady” by Marilyn Bowering. My answer to Martha re Victoria Hislop ‘The Island.’ This book was so good that a T.V. Series has been shown in which I had the pleasure of taking a small part in ,and is a huge success. I stumbled upon your website, i believe your web site is awsome, keep writing. I’m thankful I ran across your blog on msn. Thanks for the sensible critique. My wife and i had been just preparing to study about it. I’m very happy to see this sort of terrific details being shared freely out there. would choose to appreciation for the work you have made in writing this posting. I hope a similar best work from you later on as well. The fact is your creative writing skills has motivated me to start my website now. I have been to Spinalonga and have read Victoria Hyslpos book which i found very moving.Our visit to the island is one i will never forget and hope to go again before long. I have visited Spinalonga on my frequent visits to the Greek islands, most interesting indeed. Kalispera.